« MySims: Sky Heroes Trailer!!! I’ve had my Wii for quite awhile now. I’d say it’s going on about 3 years. Three glorious years. During my time with the spectacular box I’ve stood up for it at all times. I’ve written a manifesto on how you should go about buying a Wii. I’ve given you my thoughts on where the Wii may be heading, and where it should be heading. I’ve stated that the motion control answers the HDC’s have for the Wii won’t work. I’ve even written a piece on another site telling people to stop hating on the Wii. I’ve done a lot for Ninty and for the Wii, which is why I’m wondering why they’ve decided to break my heart. 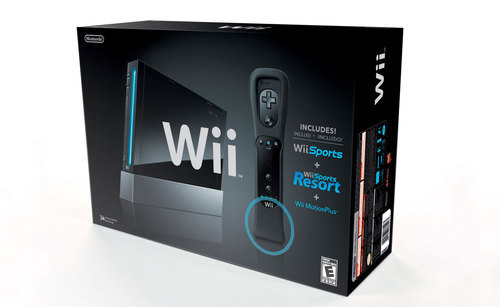 The Black Wii has been rumored for a long time. We knew it was coming when we got the black Classic controller. I mean, it was inevitable, right? Well, Nintendo dropped the bomb that was the Black Wii last week, and now I’m depressed. You see, it’s so damned choice. What I’m trying to say is: the Black Wii Bundle is ridiculously thundersex! Not only do you get the Wii in shiny black, you also get a black Wiimote and nunchuck, complete with black WiiMotion Plus. (Side-note: I’m totally crying right now…) If you’re wondering what the hell you’re gonna use that WMP for, Nintendo is also including WiiSports Resort. Don’t worry though, you will still get the original WiiSports. I KNOW! !